Poundstretcher suffered another blow only weeks after being prosecuted for fire safety breaches under the Regulatory Reform (Fire Safety) Order 2005. Their store at Boucher Retail Park, Belfast was destroyed by fire and two other stores on the site were also badly damaged as the fire spread to the two adjacent shop outlets. The fire was tackled by 17 appliances and a total of 85 fire fighters, taking five hours to bring the blaze under control. Difficulties were experienced, as the Poundstretcher store began to collapse. Several other stores were severely smoked damaged as a result of the blaze. An investigation has been launched to find the cause of the fire. No casualties have been reported at this stage. September’s customer survey winner was Mr P from Southampton. For a chance to win £25 ‘Love2Shop’ vouchers, all you need to do is complete the customer survey questionnaire after purchasing from our website. The lucky participant wins the vouchers. ‘Love2Shop’ is a highstreet gift voucher that is accepted by over 80 leading retailers, including are House of Fraser, WH Smiths, HMV and New Look. Fire crews were called to a house fire on Thursday at 11.58pm in Bridlington, East Yorkshire. Three children died in the fire and a woman of 27 years old was rescued but is in a critical condition in hospital in Scarborough. It is too early to determine how the fire started but it is thought to have started in the house. Our condolences go to the family involved. Poundstretcher, a national store chain, have been found guilty of fire safety breaches under the Regulatory Reform (Fire Safety) Order 2005. These breaches will cost the chain store £55,000. This is already their second prosecution. Poundstretcher were found guilty of similar breaches in 2009 and were fined £20,500 for these breaches relating to their Halifax and Wakefield stores. This new prosecution arose after a chance visit to the Castleford store by a fire safety officer. It was observed that the store had failed to ensure the safety of employees and customers by blocking fire escapes, inadequate training of staff and failing to review the fire risk assessment. The newly designed Sashment Emergency Fire Escape Window has been added to our range of 1500 fire safety products. This window is of a timber construction and not only offers you all the functions of a traditional sash window does but also has the capability to open up fully to reveal the entire window aperture. This makes escaping fire through the window very easy. This window provides traditional and listed buildings with a valuable and acceptable emergency exit. The units are supplied with 20mm low E double glazing units to ensure that the window complies with current building regulations, offering a U value of 1.9 W/m2. To help you buy the escape windows exactly right for your building we developed a quick and easy-to-fuse configurating tool. All you have to do is fill in the measurement fields and the window will be produced bespoke to your requirements. In September Mablethorpe celebrated its annual Beach Festival. The festival holds the title of longest linear coastal art festival in Europe. A record number of visitors turned out to enjoy the music and crafts provided at the festival, with 25,000 attending. The cultural mix on offer ranged from a theatre on wheels, Shakespeare, local bands and entertainment in the beach huts. The grand finale was a fire parade through the streets of Mablethorpe. 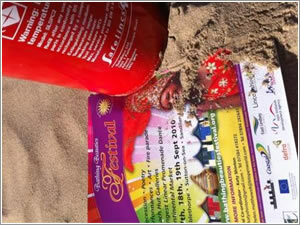 Safelincs were happy to support this event by providing free fire extinguisher cover for the duration of the festival. we would like to congratulate the organisers for a superb event and wish them every success with next year’s festival. We are always looking at ways of improving our systems and through our customer surveys ask our customers to tell us what they would like us to do for them. One suggestion that was made by some of our customers was to have a log in system to enable them to place repeat orders without having to put all their details in. We took these comments seriously and began working on a solution to this problem. Our in-house Web Developers began to research together with our Customer Care team to find out how to make our registration and log-in process simple and enjoyable for customers and what causes problems and dissatisfaction with the systems most companies use. We wanted to have a system that not only addresses the issue raised through our survey but that really would make the buying process easier. It was quickly identified that many websites have an unfriendly approach to new customers. They force customers to register first before they ‘allow’ them to use features or before they display their shipping charges. Another typical problem with login systems is the impossible expectation that customers can and want to remember all usernames and passwords on every website. And not every customer wants to retrieve their password by answering questions about their mother’s maidenname! Most websites will not allow you to re-register again with your email address, once it has been used on a previous occasion. Our system needed to resolve all these issues at the same time, but how could this be done? Having an in house web development team means that we can hold speedy inter-departmental meetings and hear the view of all users. The system needed to be user friendly to customers ordering over the internet and also be accessible for orders made over the telephone. The system we have developed does all this and more. When a new customer places their first order, an account is created automatically for them using their e-mail address as the user name. Their full log in details are then sent to them in the order confirmation email together with a copy of the invoice. This means that they don’t have to read an extra e-mail or go through what can sometimes be a long process of setting up an account. Using the log in details sent, they can view orders placed, view and edit any delivery addresses they have used and manage any reminders they have set through our free reminder service to test smoke alarms etc. When a returning customer comes back to the Safelincs site they have the option to log in to their account by clicking on the log in tab on the menu bar. Our customers then do not have to re-enter delivery details when placing their order. To improve this further we have created a system that should the customer not choose to log in when placing the next order, their order can still get added to the account as long as the e-mail address entered in at checkout matches that of previous orders and the customer gives his assent by clicking a single reply button on their order confirmation email. At last a customer account system that is user friendly and gives the customer control. No more frustrations because passwords have been forgotten and e-mail addresses are already in the system, preventing the creation of a new account. No need to login to have orders added to accounts. Liberal Democrat MP, Adrian Sanders, has introduced a private members bill to ensure that landlords are responsible for having a working smoke alarm system for the premises they let. This bill will now have its second hearing. The bill outlines the responsibility of landlords to ensure that on the onset of a new tenancy there is a functioning mains wired smoke alarm system installed in each property. The continuous responsibility to ensure that the alarm system is in good working order would then be that of the tenant. Mr Sanders hopes that this bill will help to protect a vulnerable section of our society. It comes as a result of two children dying in a fire in a rented property in Torquay in October 2009. The property was not equipped with smoke alarms. When purchasing a CO detector (or any alarm/detector) it is advisable to always check for the type of certification that has been awarded. Please browse our full range of Kitemarked marked CO detectors.